On a cold, wet, and windy morning in late October, our party huddled in Stony Clove Notch, the halfway point of the Catskills’ infamous Devil’s Path. We were sitting, shivering in the lee of a boulder, and watching a pot of water try to boil when, without warning, the fuel ran out. We checked it, shook it, tried again and again to light it, but that was that—it had kicked. There would be no hot breakfast this morning. There would be no coffee. No. Coffee. We’d walk off the cold on the climb out of the notch, but we learned two valuable lessons that day. 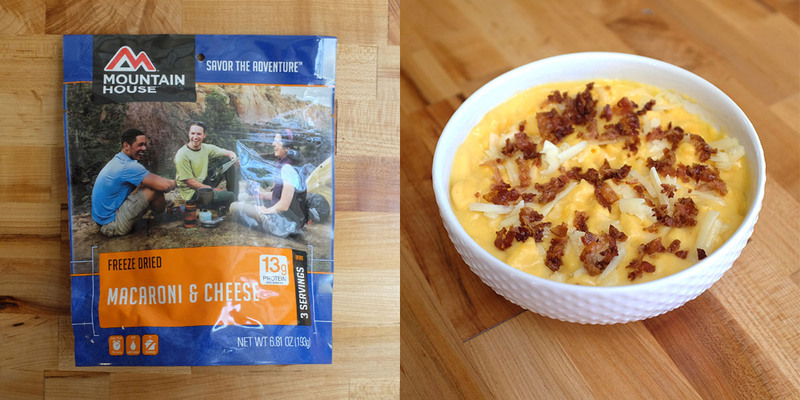 One, nothing takes the wind out of your sails quite like running out of stove fuel, and two, always bring enough. 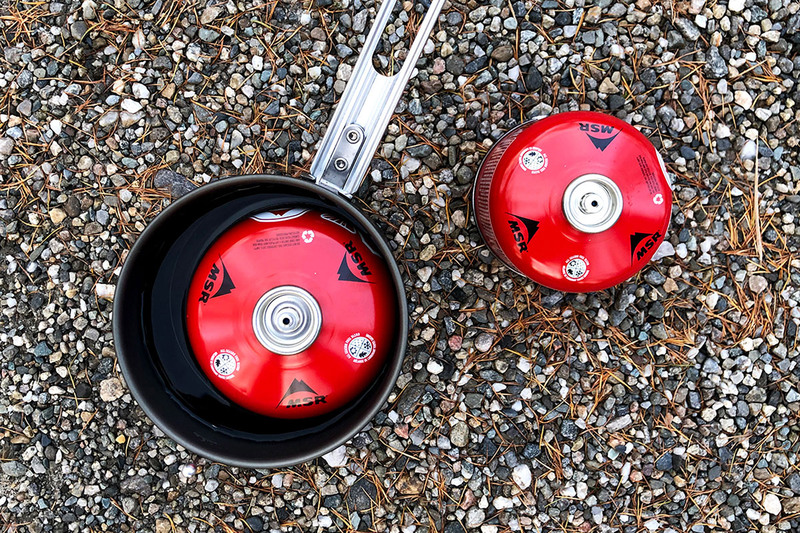 Because canister stoves use stock container sizes—a common knock when debating the merits of liquid versus gas backpacking stoves—it’s not super easy to tailor the amount of fuel you’re bringing into the backcountry. 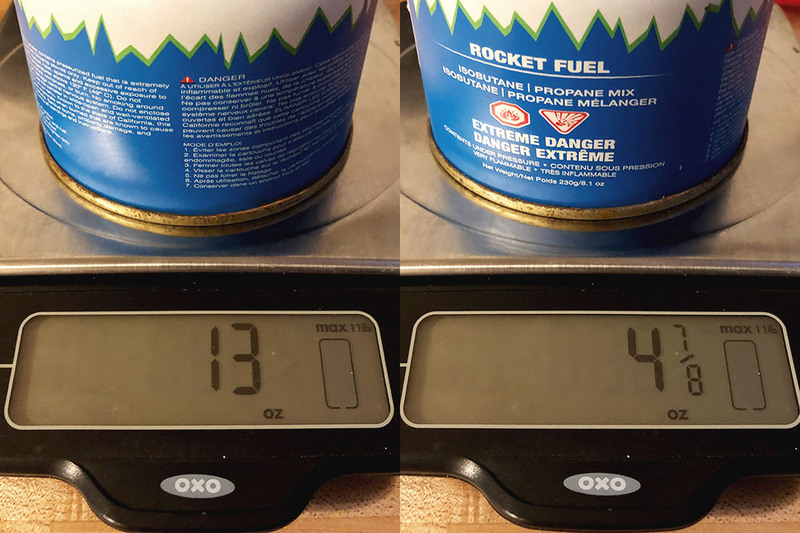 Short of hauling extra canisters (heavy), or only packing-in full canisters (wasteful), your only option is to measure just how much fuel actually remains in that used canister you’ve got hanging around. Here are a couple of ways to do just that. To measure a fuel canister’s contents, weighing it is a reliable and fairly accurate method. This is optimally performed with a digital scale. Kind of a specialty item, these scales aren’t crazy expensive and are a fantastic tool to have in the kitchen if you’re the cooking type. They are not, however, ultralight or especially useful in the field. So, you’ll need to do this exercise at home, before the trip. Gather two fuel canisters of the same brand—one with some gas left and one empty. Since the exact mixture, manufacture, and packaging vary from company to company, it’s important that the canisters be of the same brand. This is when you’ll need that digital scale, and since there’s a bit of math involved here, it couldn’t hurt to grab a scrap of paper and a pen—or to open up that calculator app. Weigh the empty canister, and record its value. This measurement gives you a baseline for what the container weighs by itself. Next, weigh the semi-full canister and record this measurement. Now for the arithmetic: Go ahead and subtract the weight of the empty canister from the semi-full canister. The resulting value tells you how much gas you’ve got left. Fuel weight to burn time ratios vary from stove to stove, however. So, a little research on your specific setup will be necessary to find out how long those ounces will last. 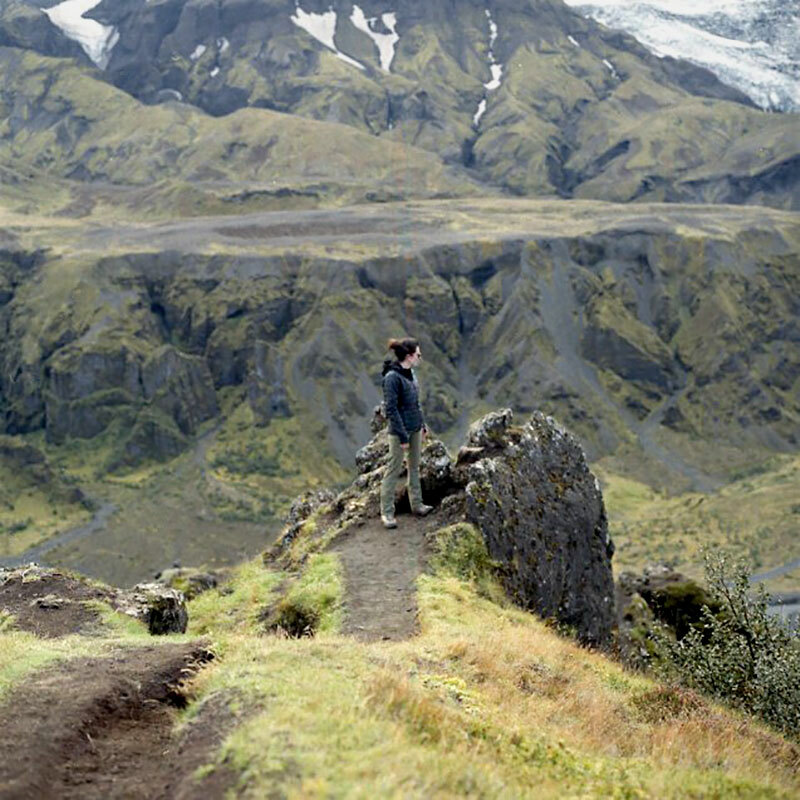 Measure that against the needs of your trip, and you’ll have a good idea of what to pack. Side note: If you’re using Jetboil canisters, the Jetboil JetGauge Canister Weight Scale offers accurate weight measurement in the field. It’s small and packable, and goes one step further for you, converting the weight into a percentage value to represent the remaining fuel. 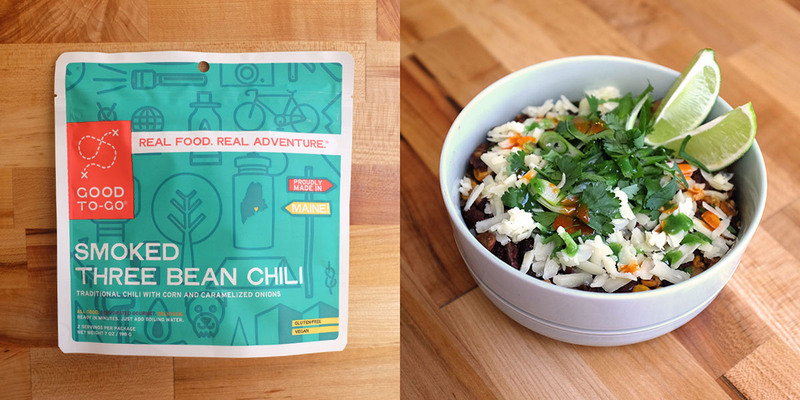 At home, a digital scale is a luxury, but in the backcountry, it’s an impossibility. Fortunately, thanks to physics and the fuel canister’s natural buoyancy, there’s still a way. 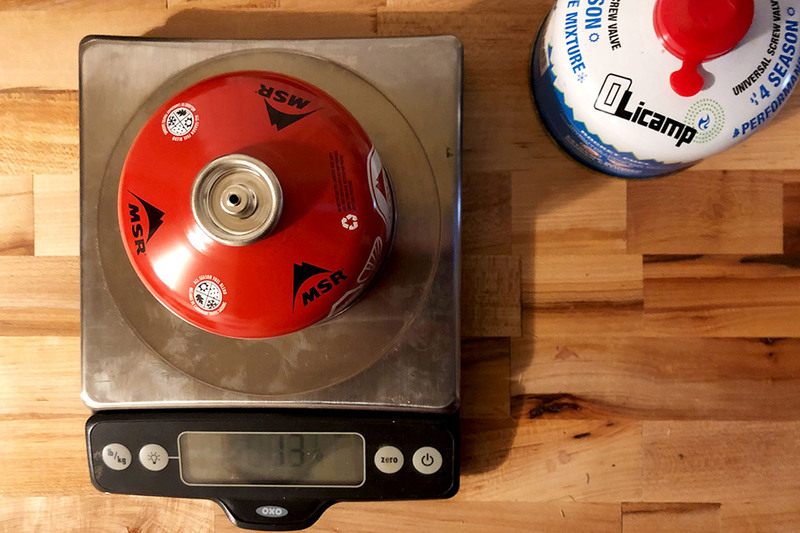 The principle is simple: A full canister weighs more than an empty one. Ergo, the more fuel in the canister, the lower it will float. Start at home with two canisters of the same brand—one full and one empty. You’ll also need a permanent marker and a pot or bowl large enough to hold your canister and a sufficient amount of water to float it. Fill the vessel with just enough water to submerge a single canister. Then, gently add the full one, tilting it slightly to free up any bubbles that got caught in the concavity underneath. Also, be sure not to get any water in the little area around the valve, as this will skew your reading. Let the canister settle, and check the water line. Once it’s not moving around as much, take it out of the vessel, and mark the water line with a permanent marker. For accuracy, a good move here is to eyeball a feature printed on the canister that lines up with that water line. Now, repeat the process with the empty canister. At this point, you’ll clearly notice the difference in where the water line hits. Finally, line up both canisters on a flat surface and copy the marks from one to the next, so that each has an approximate “full” and “empty” line. Provided you’re using the same brand of fuel moving forward, you can keep one of these marked canisters to use as a template to mark future ones. 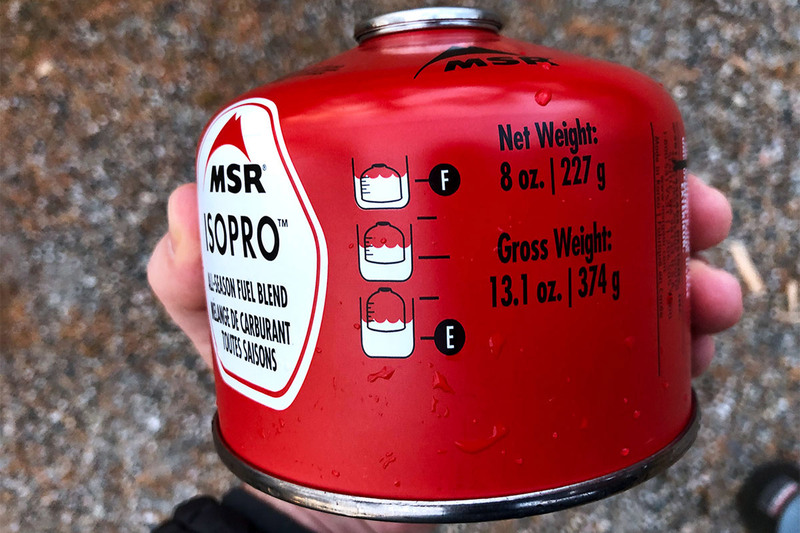 Some companies, like MSR and Jetboil, have taken to printing “fuel gauges” on their canisters. This cuts the advance work out of the picture and allows you to measure your available fuel on the fly. There are no doubt hordes of OGs out there who swear by the shake method, and that’s cool. For reference, this is when you shake a used canister to see if there’s anything left and make a judgement by touch and heft. It can work, too, but only to a very rough degree of totally subjective accuracy. The method also relies heavily on experience. 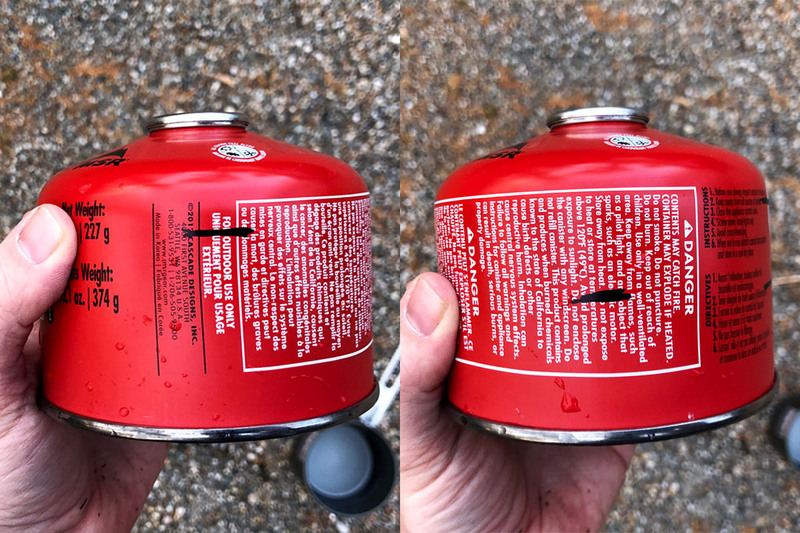 So, if you’re new to your camp stove, keep away from this approach. You can also combine your knowledge with the information provided by your stove’s manufacturer. For example, an MSR Reactor stove set up with a 1L pot should—according to the manufacturer—burn through an 8 oz. canister in approximately 80 minutes, producing 20 liters of water in the process. Unless you’re on a trip that requires melting snow as a water supply, that’s enough to last a single person for a week—10 days if you’re stretching it. If you can keep track of just how many times you took your canister out, and roughly how much you used it each time, you can get a decent estimate. Unlike weighing or floating, though, you’re still essentially making a guess rather than taking a measurement. At the end of the day, preparedness relies on experience, and there’s no way to get that but to spend the time. The more you get out there, the more you’ll know about which type of stove fits your needs, and how much fuel you’ll need to bring along. Waking up without coffee is a bummer, but when you’re really out there, a working stove—that you know how to use and are comfortable with—can be the difference between a good trip and a serious situation. So, give these methods a shot and let us know which works best for you. Over the past few years, the debate over public lands and conservation has been a national political flash point. The reductions of Bears Ears and Grand Staircase–Escalante National Monuments, the reopening of mining in the Boundary Waters, and attacks on pro-environmental policies illustrate the attitude current officials have toward conservation. It’s a grim picture. But, there is a chance for some good news. This November, protecting public lands at the local level has made it onto the ballot. Protecting state-owned land in Connecticut is of critical importance. It preserves our heritage, it protects our natural resources and wildlife habitats, and it provides much-needed open space in one of the country’s most densely-populated states. If you’ve spent any time in the Nutmeg State, you know what I’m talking about. Names like Hammonasset Beach, Squantz Pond, and Sleeping Giant likely evoke pleasant memories of days spent outside. 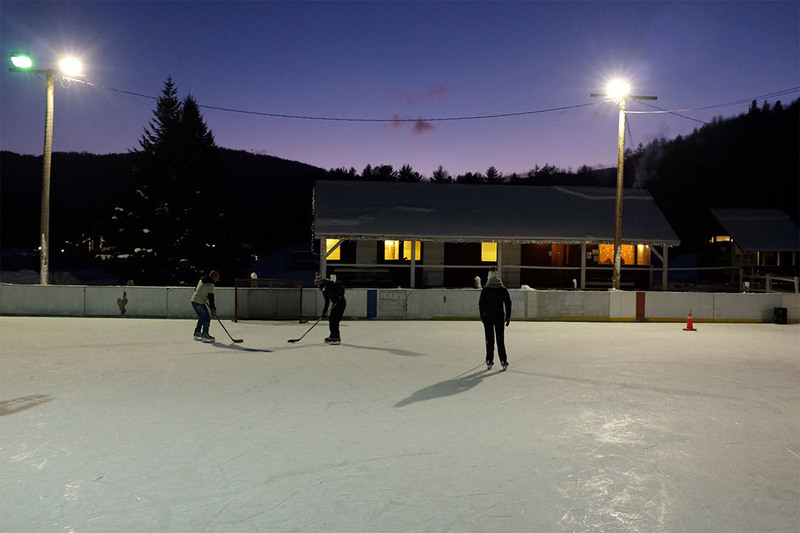 As much as grinders, white clam pizza, and the Hartford Whalers, they’re an inextricable part of the state’s culture. 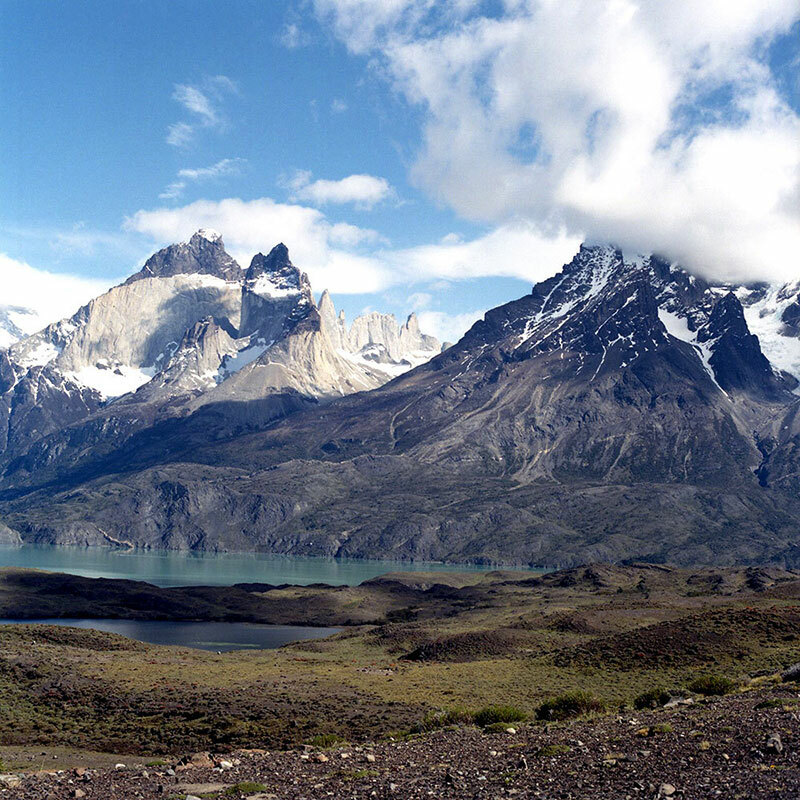 However, if you can believe it, these places are essentially unprotected. They can be sold, traded, or given away without the public’s input, in the dead of night, over a handshake deal. It sounds insane, but it has actually happened before. Come November 6th, though, it doesn’t have to happen again. “Question 2” is simple. 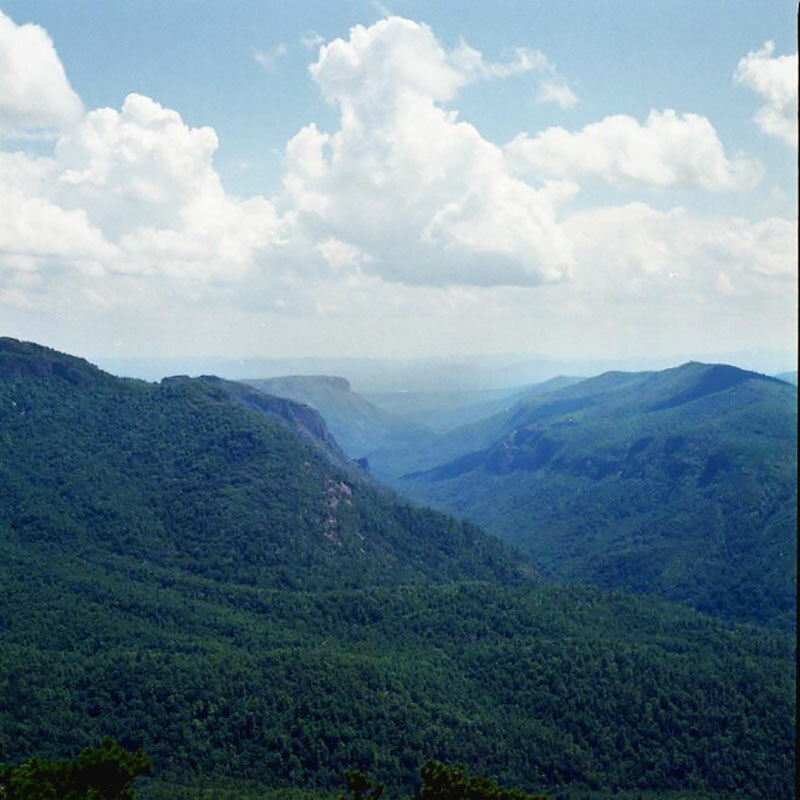 Essentially, it asks if the state’s constitution should be amended to protect these places. A “yes” vote would mean two things. One, the transference of state-owned land would need to be subjected to a public forum. Secondly, any such transference would require a two-thirds majority vote by the state’s legislature. While it seems pretty straightforward, it’s not entirely unprecedented, either. Massachusetts and New York already have similar provisions in their respective constitutions, as does Maine. Our neighboring states seem to realize that retaining public lands is significantly more valuable than their price tag would suggest. Forget about natural beauty and a clean water supply for a moment. Instead, looking at the purely pragmatic, bottom-line-numbers side, they make money. Fees collected at state parks, forests, and beaches generate revenue, and their operation and maintenance create jobs. Beyond that, dollars spent at businesses adjacent to these public lands offer a significant boost to those local economies. 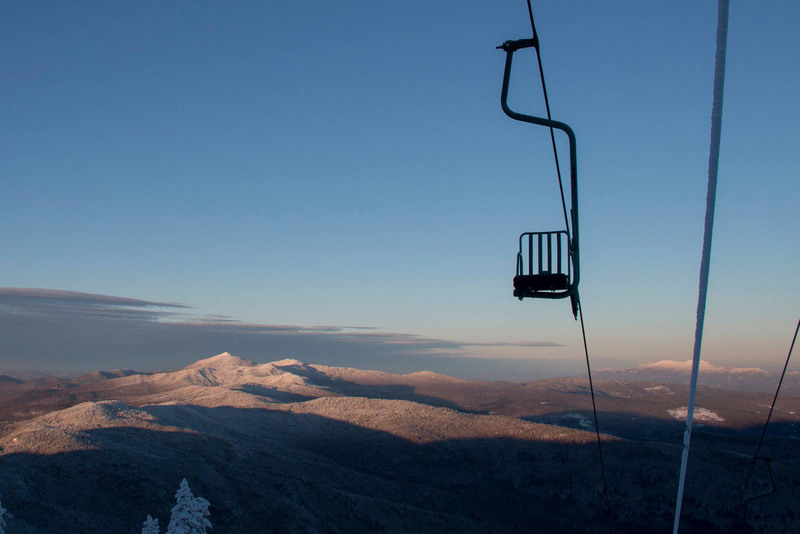 Meaning, again, public lands help generate more money and more jobs—two things Connecticut just happens to really, really need right now. So, here’s what you can do: If you live in Connecticut, vote “yes” on Question 2 on November 6th to protect Connecticut’s state parks, forests, and beaches for generations to come. If you don’t live in Connecticut and are interested in safeguarding your state’s public lands, call up your local representative to see what’s what. Maybe you can get yourself a constitutional amendment of your own. In the digital realm, memory cards with almost-unlimited, deletable memory hold the majority of our images of the outdoors, and computer-based editing lets you fine-tune that nearly perfect shot. But, shooting nature the old-fashioned way has its benefits, too. First things first: Film will cost you. It will cost you time, it will cost you space in your backpack, and it will most definitely cost you money. If you’re like me, it’ll likely also cost you sleep, as you think about what you could have done differently with a certain frame. Or, maybe, it will cost you a few gray hairs, as you anxiously wait to see how the processed negatives from an exciting sojourn abroad turned out. But, film photography can also change the way you think about making images or even what you decide to shoot. With time, it’ll make you a better photographer and more a part of the moments you choose to document. Ultimately, it’ll change the way you see, and it’s a lot of fun to use! Get started by picking up a film camera. Hit up a tag sale or a flea market. Or, poke around the internet a bit to see what strikes your fancy—Craigslist and eBay are both excellent resources. In all cases, 35mm film cameras are widely available, and the film typically has 24 or 36 exposures per roll. 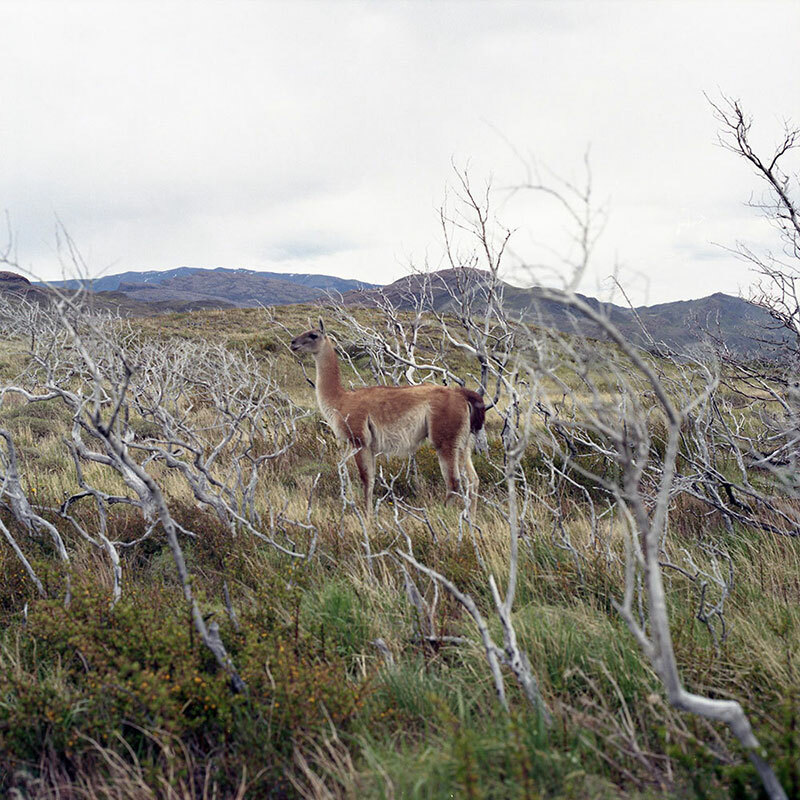 Medium-format cameras take 120 film, which is a bit bigger and produces a larger negative. Generally speaking, though, these cameras—and their film—are a little less accessible. They’re less forgiving, too, usually producing just 12 images per roll. You can get your film on eBay or at a tag sale, but it does have an expiration date. As a side note, using expired film can produce some cool effects. However, you’re probably safer sourcing from a camera supply store (yes, they still do exist). Tip: Buy film in bulk to save some money and refrigerate it. Cooling it down significantly extends its lifespan. Next, the hard part: Finding room in your bag. Full disclosure: There is nothing ultralight about this. The film adds weight, and the older cameras have more in common with bricks than today’s backcountry equipment, but remember how much fun you’re having. Personally, I only drag a camera along when I’m going somewhere far away, as opposed to a walk through the local park, and want to get the most out of photographing the experience. I’m also not lugging it on longer backpacking trips, where weight and space are serious issues. Overall, consider where you’re going and how much you want to carry. It will take some trial and error to figure out how many exposures you’re going to make, and you’ll likely need to drag some unnecessary ounces around before you find a good fit. Also—and this is no different from using digital equipment—make sure you have a way to keep your gear dry. If you’re carrying the extra stuff, it’s a whole lot nicer to have it working than not. It’s worth noting that film is expensive—infinitely more so than if you just whipped out your existing phone and fired away. You’ve got the camera setup and the film, and then, you have to get it processed and either printed or digitally scanned. Most opt for the latter, unless you’re looking to gift or sell any of your images. All in all, it’s not cheap. But, consider this a positive and use it to your advantage. Instead of running around with your phone out the whole time, take the opportunity to be deliberate and present. When you have a price tag attached to each image and a finite number of potential exposures, you’re going to really see what’s around you before raising your camera. Being in the moment ultimately helps you make better images and, moreover, connects you to what’s around you more than ever before. Lastly, just have fun with it. Like getting out into the woods after a long work week, treat shooting film as a change of pace. Time in the backcountry seems to slow down in such a tremendous way that it only makes sense to capture it with a fitting medium. 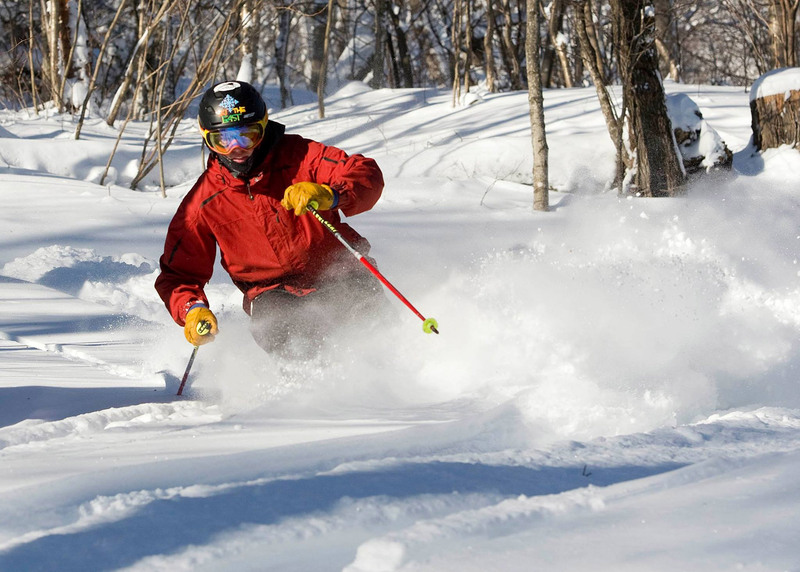 Often overlooked for its grander neighbors to the north, Connecticut actually offers some top-notch trails and a surprising variety of terrain. You could reasonably find yourself scrambling up a cliffside in the morning and relaxing with a lobster roll and a beer on the beach by lunch. 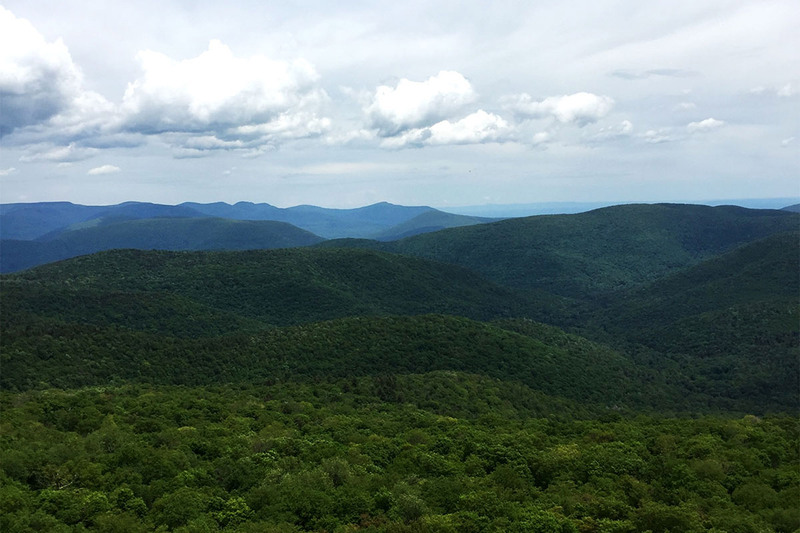 That’s the beauty of hiking in the Nutmeg State—you can have it all. 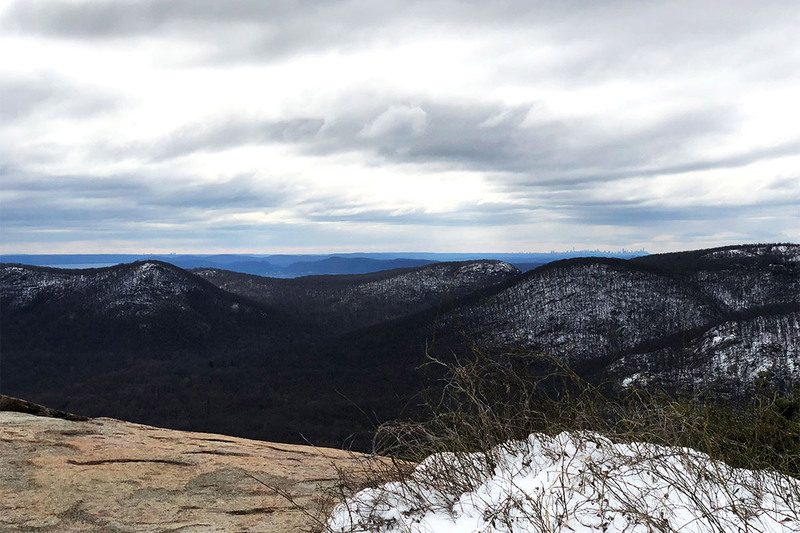 The Litchfield Hills in Connecticut’s Northwest Corner account for much of the state’s elevation gain and include both its highest point (on the slopes of Mount Frissell, whose summit is actually in Massachusetts) and its highest peak: Bear Mountain. This six-mile loop starts out at the Undermountain Trailhead on CT-41 in Salisbury. The blue-blazed trail climbs steadily through a mixed forest before dead-ending at the Appalachian Trail. Bang a right (north) and keep climbing, a bit steeper now, over some semi-exposed ledges, until you reach the manmade stone pyramid at the summit, which is over 1,600 feet higher than where you started. Once you’re on top, it’s easy to see why this is one of the state’s more popular hikes, despite its relatively remote location. Descend by continuing north, down a steep stretch of boulders that turn into a bit of an icefall in winter. Keep on the AT to Sages Ravine just over the state line in Massachusetts. Head right yet again on the Paradise Lane Trail for a very chill, flat mile-and-a-half before you take a left back down the Undermountain Trail to the road. Bonus: Make this a shuttle hike to take in Lion’s Head, an exposed ridge with more excellent views. 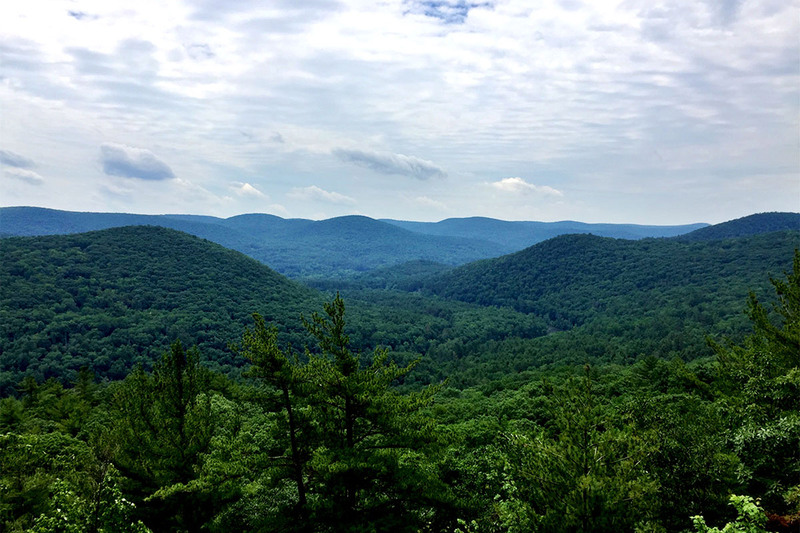 Start your hike where the AT intersects with CT-41, just three miles south of the Undermountain Trailhead. Another Litchfield Hills beauty is the Macedonia Ridge Trail in Kent. 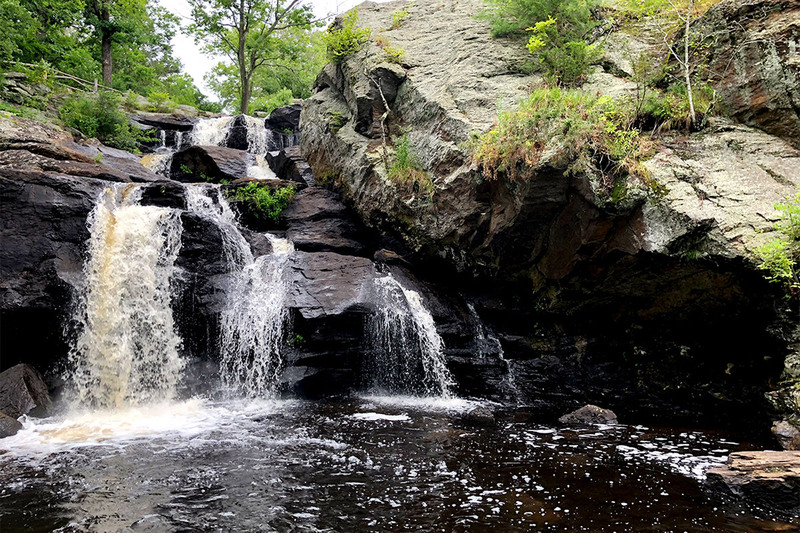 Running a 6.5-mile loop around Macedonia Brook State Park, the trail goes through four distinct ecosystems with a little bit of elevation change (around 1,750 feet gained, all told) and varies in footing from a narrow footpath to an old forest road to a ledge scramble. Beginning from the parking area on Macedonia Brook Road, walk back along the road the way you came (south) to find the trailhead, which is marked by a light blue blaze on the opposite side. Keep on following those blazes. 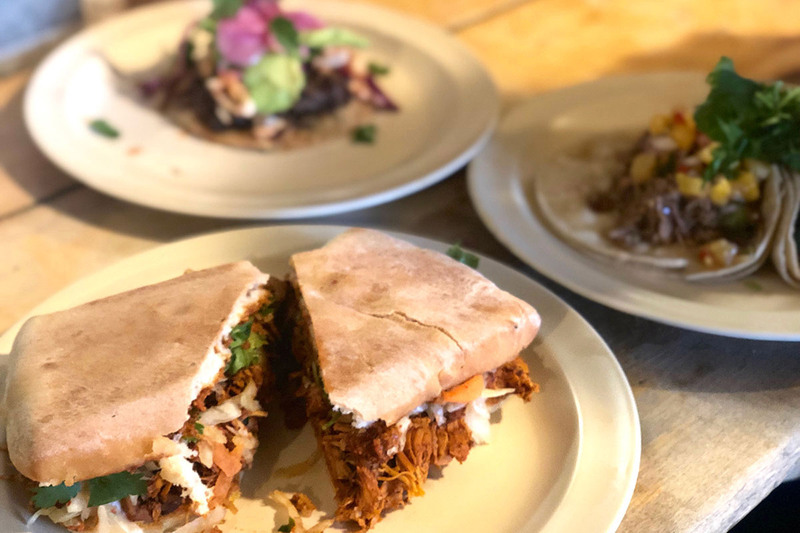 You’ll get plenty of up-and-down over rolling hills through new-growth forest, along a densely fern-covered brook bed, and an old road with old stone walls that seem less like a manmade intrusion than a component of the surroundings. At around mile 4.0, you start really going up, reaching a ledge with outstanding southerly views. 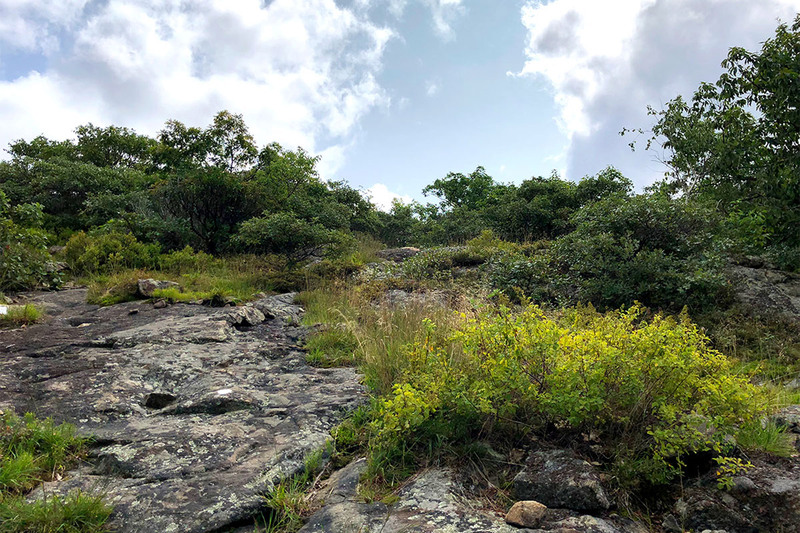 Hop on down into a little hollow before coming to a fun scramble up to the summit of Cobble Mountain, the hike’s high-point with extensive views west. 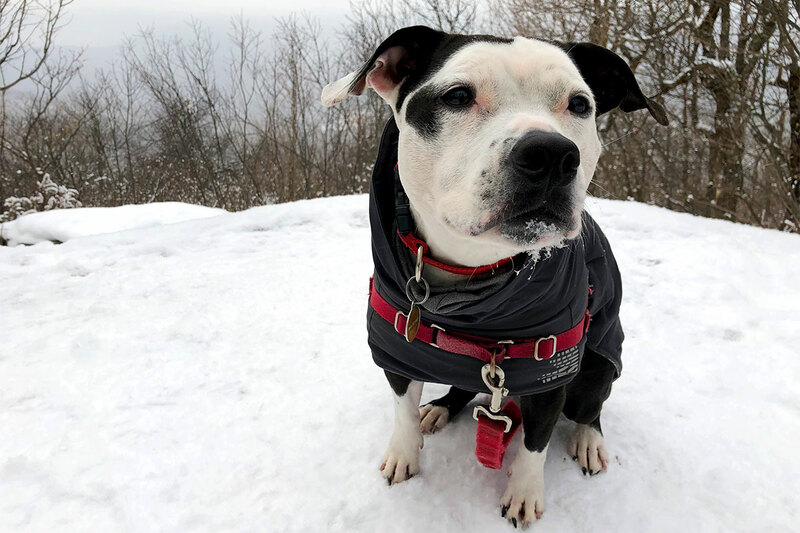 If you’re rolling with your puppy friend, they may need a hand at this part. From the top, stick to the light blue blazes, and descend through abundant mountain laurel and coniferous forest for two miles or so back to the parking area. Bonus: Kent Falls Brewing Company, an independent brewery on a working farm, is just a short drive from Macedonia Brook State Park. Grab yourself a beer—you deserve it. 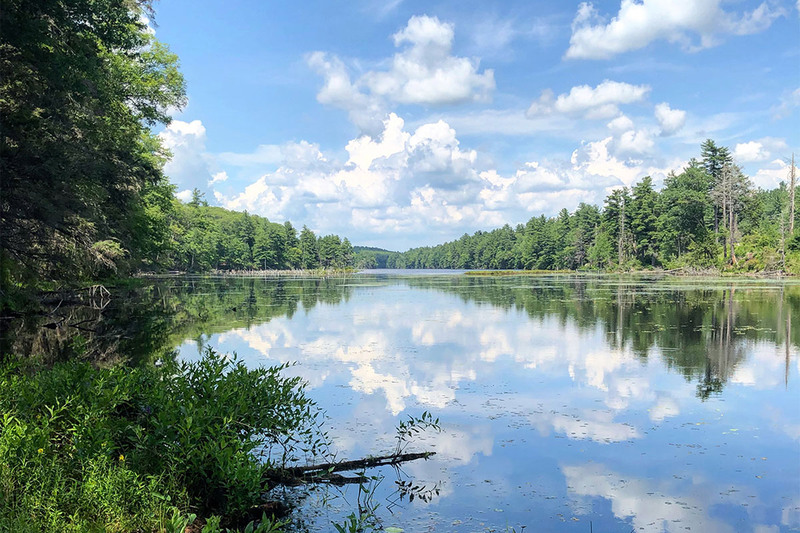 Connecticut’s “Quiet Corner,” the rural northeastern part of the state, is home to Bigelow Hollow State Park and Nipmuck State Forest. It’s just a hop, skip, and a jump from I-84 but far from everywhere else, and it feels that way. Enter the state park on CT-171 in Union, and you’ll find the parking area about a half-mile up the access road on the left-hand side. 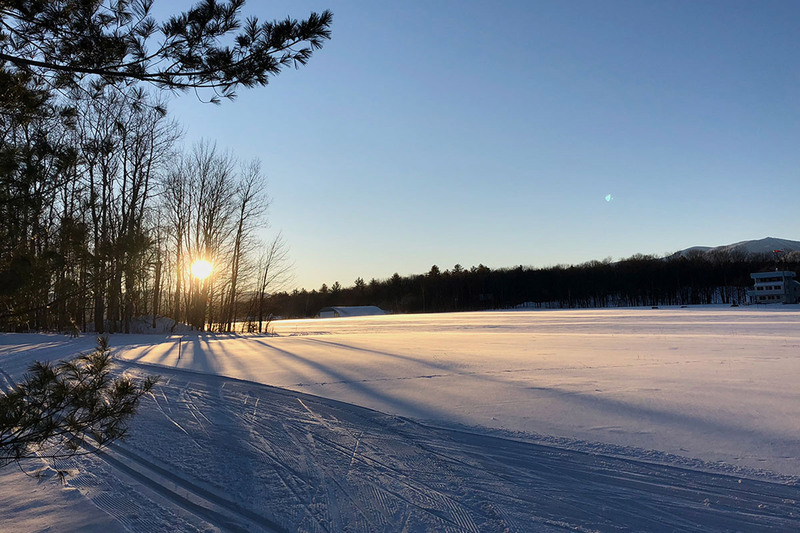 Here, you can access a white-blazed trail that, after a quarter-mile, runs into the also-white-blazed Park Road, a forest road that runs from CT-171 to Breakneck Pond, our main destination. Park Road is wide and generally flat—easy for hiking but watch out for the bug population in summer. 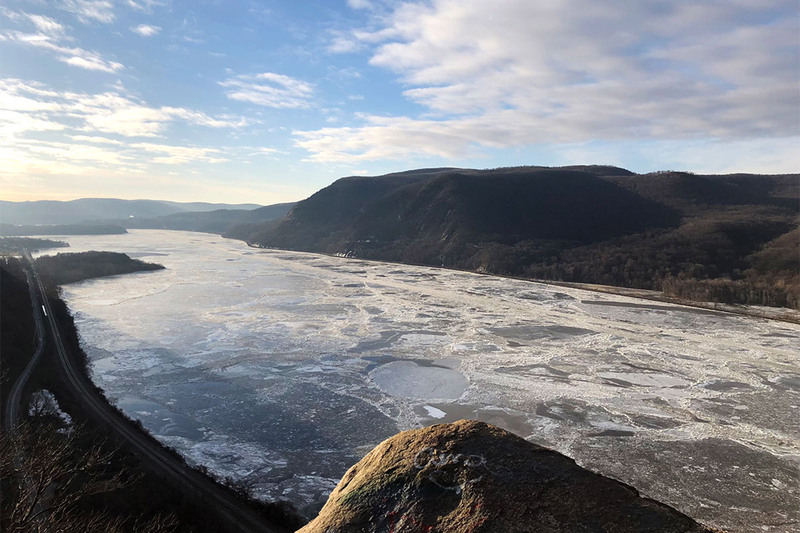 After another 0.8 wooded miles, you’ll come to a junction with the East Ridge Trail and the Breakneck Pond View Trail, indicated by light blue and red blazes. Take a left to follow this decidedly more rugged trail for another 1.8 miles. 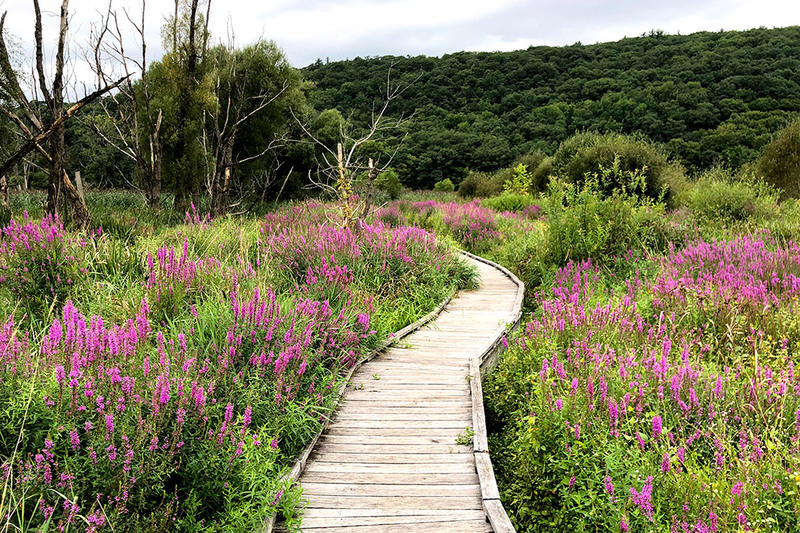 It quickly becomes a narrow footpath along the pond’s western shore and offers intermittent (and beautiful) lake views, until you enter Massachusetts for a quarter mile or so. Then, welcome back to Connecticut! From here, the Breakneck Pond View Trail runs into the Nipmuck Trail. This takes you back down the pond’s eastern edge and features more intermittent-but-stunning views. Eventually, you’ll return to the junction with Park Road and get back to the parking area. 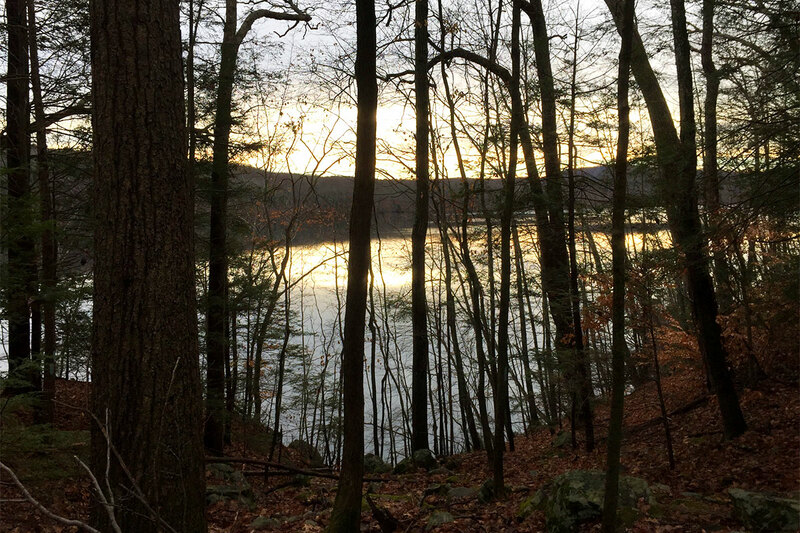 Bonus: You can do a circuit of the park’s three bodies of water—Bigelow Hollow Pond, Mashapaug Lake, and Breakneck Pond—with a cool, clover loop-style traverse. Total mileage: 11.8 mi. ; total elevation: around 1,025 feet. Devil’s Hopyard State Park in East Haddam is a cool spot with a cool name. It also packs a waterfall, a viewpoint, and a couple of geologic formations attributed to the devil into just 860 acres. Connecting the orange-blazed Vista Trail with the unnamed white-blazed trail makes a three-mile loop on the eastern side of the Eightmile River and hits all the highlights. The area around the parking lot on Foxtown Road and the adjacent Chapman Falls is rather developed and may be mobbed on a nice day but don’t be discouraged. The falls are beautiful, and the woods are right around the corner. Head down the path (with the falls at your left) and cross the covered bridge to access the Vista Trail. Head straight (south) to start your counterclockwise loop. Follow the orange blazes, bearing right when the trail splits into two separate spur trails that are both worth checking out. The first, at 0.4 miles, is a short but very steep spur trail to the Devil’s Oven, a small cave in a massive rock formation located in a densely shaded hemlock grove. The second, at 0.8 miles, is the viewpoint that gives the Vista Trail its name. While it’s worth a stop for a snack and a drink, the rolling green hills and the lack of manmade structures make for a welcome relief in one of the country’s most densely populated states. Back on the trail, at 1.4 miles, bang a right, leaving the Vista Trail for the White Trail. This trail winds its way for another 1.5 miles or so through dense forest back to the falls. However, take care when following the trail here. There are more than a few unblazed footpaths that crisscross this part of the woods. Back at the falls, end your hike by checking out the potholes, a handful of unnaturally perfect, cylindrical pools carved into the ledge on the eastern bank. Credited to the devil by the area’s earliest settlers, these geologic anomalies were actually caused by tiny grains of sand caught up in the swirling eddies. Not a bad guess, though, by the settlers, since they wound up giving the park such an awesome-sounding name. 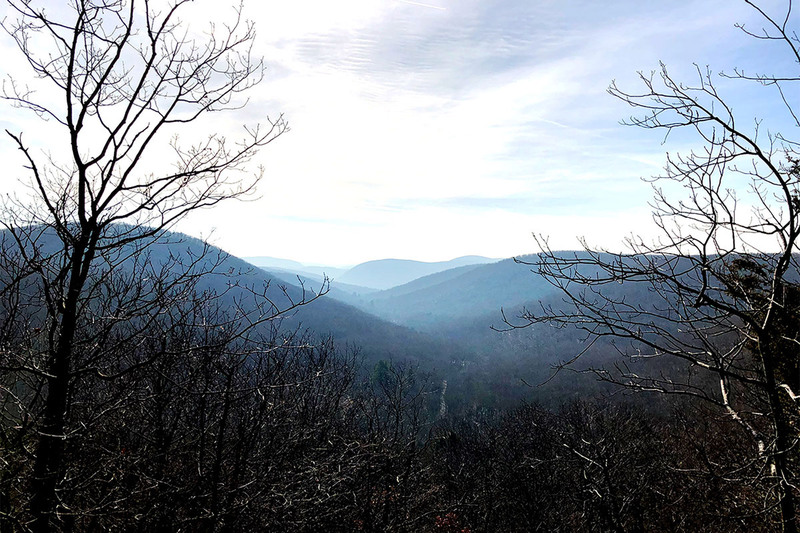 Back in the Northwest Corner is the Pine Knob Loop, a short but sweet little hike in Housatonic Meadows State Park that connects the Appalachian Trail with US-7 in Sharon, CT. 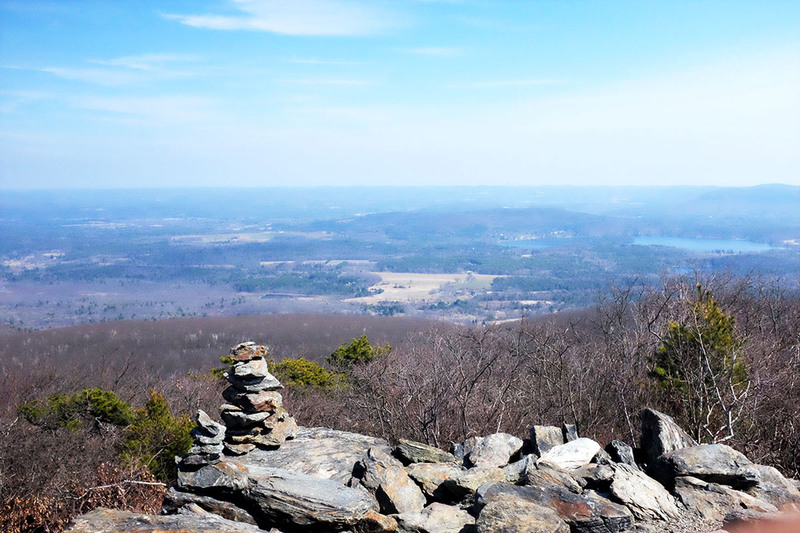 In just 2.5 miles, this route climbs around 750 feet in elevation and features some of Connecticut’s finest hiking. 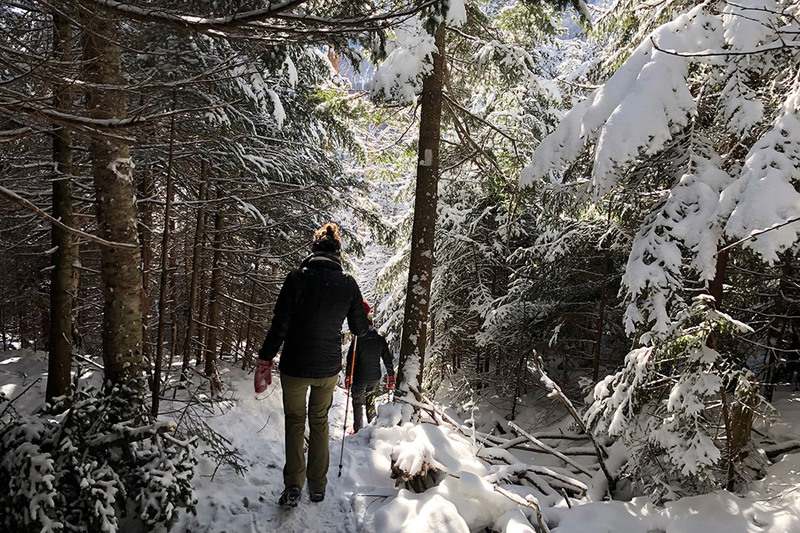 From the trailhead parking lot, follow the blue-blazed Pine Knob Loop Trail into the woods, crossing Hatch Brook and running along an old stone wall up to a junction. Here, the Pine Knob Loop Trail splits, so continue to the left and begin climbing moderately. With Hatch Brook to your left, the trail continues climbing through a pine forest. With a little breeze, the sounds of the wind through the pines and the brook running down the side of the hill make for a really special, peaceful time. Keep on climbing, until this branch of the Pine Knob Loop Trail intersects with the white-blazed Appalachian Trail, and take a right. Here, the hike begins a relatively rough ascent, climbing over rocks to one of two excellent viewpoints. Keep on the AT as it rolls over the ridge and ultimately begins descending. Then, rejoin the Pine Knob Loop Trail as it breaks off to the right. The trail descends steeply to another excellent viewpoint, before ultimately leveling out and arriving back at the split. Here, take a left, cross the brook again, and you’ll be back at the parking lot. For many, a swaying hammock is synonymous with relaxation. The word alone conjures memories of breezy summer afternoons: a cold beer sweating in the heat, dappled sunlight dancing through leaves, and gentle rocking that lulls you into a midday nap. It is the physical manifestation of the word “chill.” But, its portable, lightweight design is just as convenient for camping in the backcountry as it is for lounging in the yard, the park, or on the beach. I started hammock camping a couple of seasons ago, and on solo overnight trips, it’s my absolute go-to. 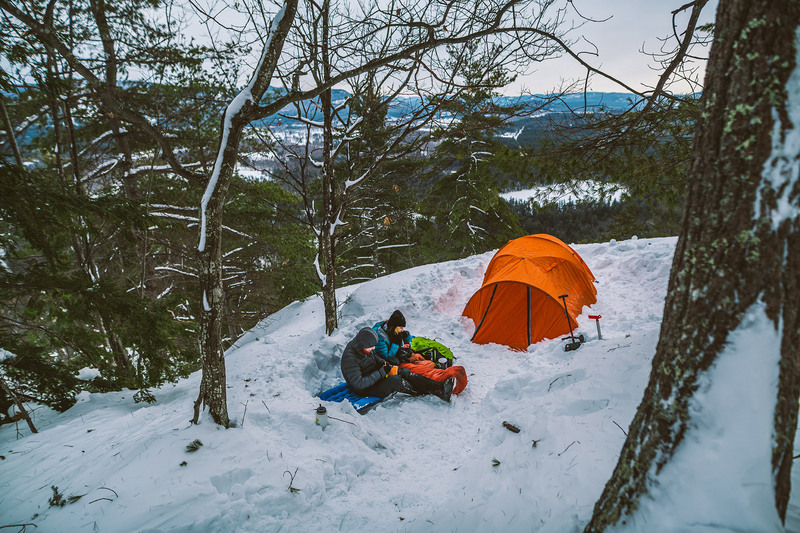 It’s wicked easy to set up after a long day of hiking, and it’s a significantly more sustainable, lower-impact way to camp. Provided you don’t need all the add-ons for every trip—like a rainfly or bug netting—it’ll even lighten the load in your pack. 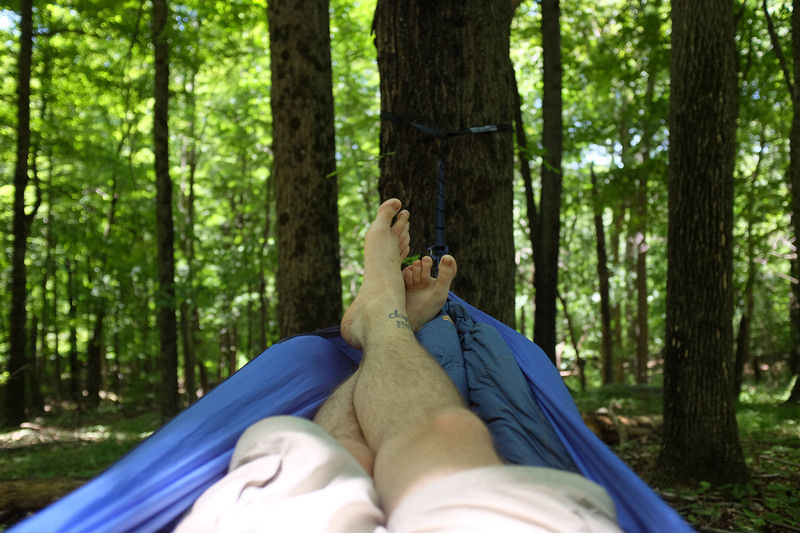 It is a different game, though, and you have to consider a couple of things before grabbing your hammock and hitting the trail. First thing’s first: you’ve got to get yourself a hammock. However, the “right one” is really just about finding a combination of size, material, and extras that make sense for you. 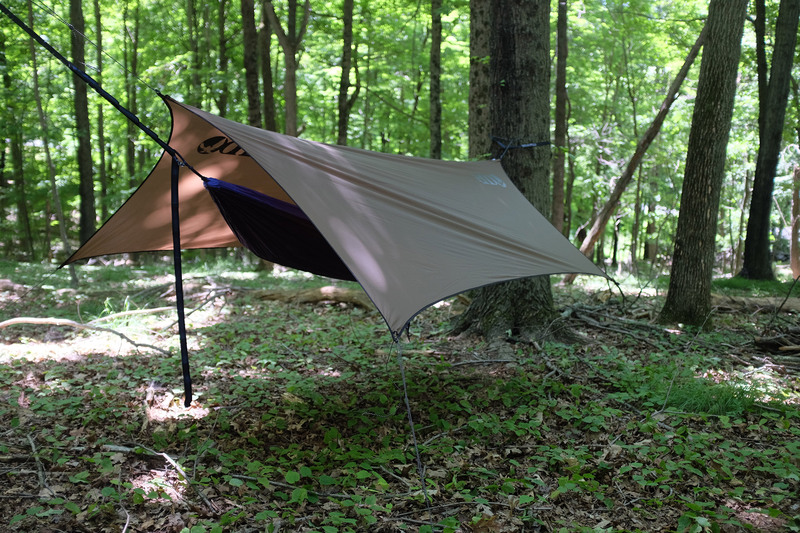 Backpacking hammocks tend to come in two widths—single and double wide. Just like it sounds, a single is a good fit for one person, while a double is a bit wider and good if you’re expecting company or just want a little extra room to kick it solo. The material boils down to weight versus durability. 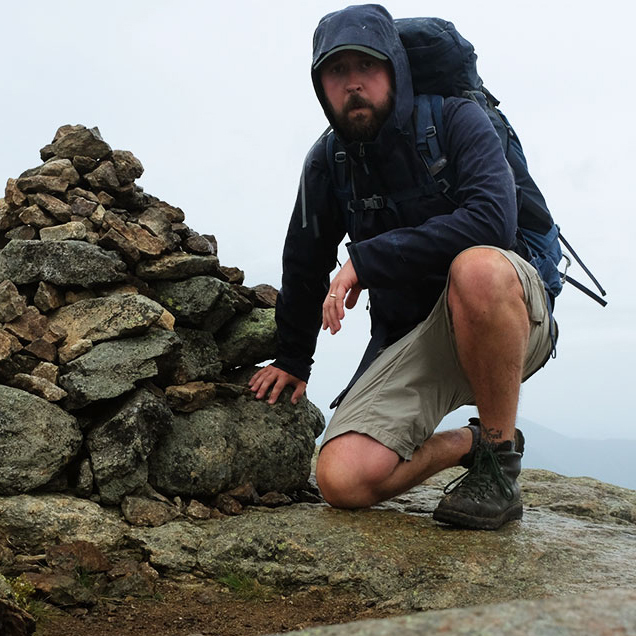 A heavier-duty fabric lasts longer but will add ounces to your pack. A lighter fabric will wear quicker but packs down smaller and keeps it light on the trail. Extras are in name only. 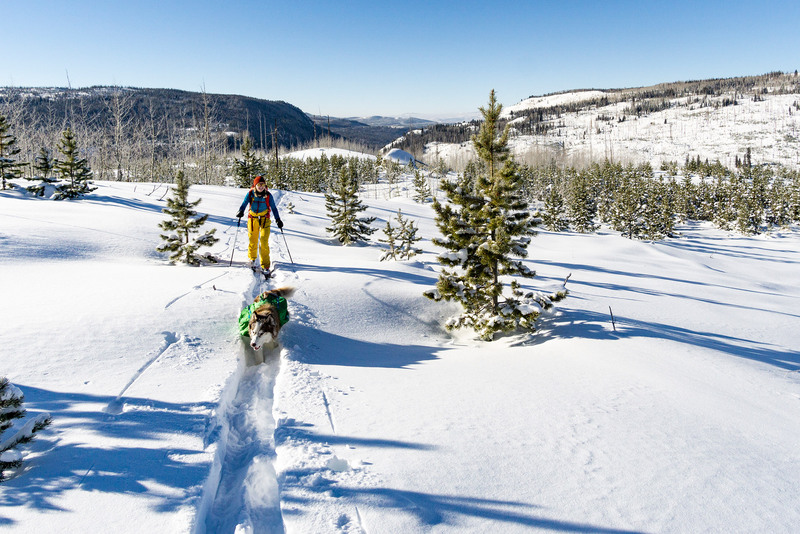 In the backcountry, you’re probably going to want at least a few of them. So, let’s start with suspension. I love the ENO Atlas Hammock Suspension System. It goes up quickly—a bonus after a long day of getting beat up in the mountains. Also cool? 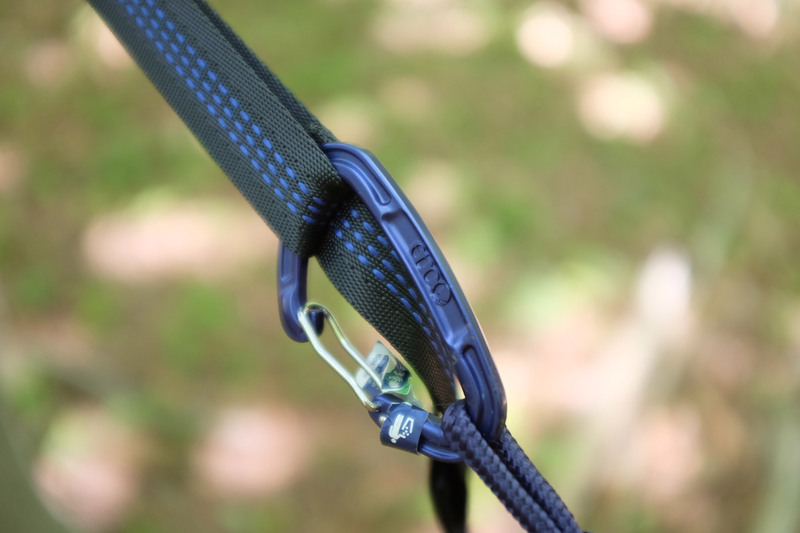 They’re designed to lessen the impact your hang has on the trees you’re using. Next up? Bugs. Heading out in black fly season or just want to keep the mosquitoes at bay? 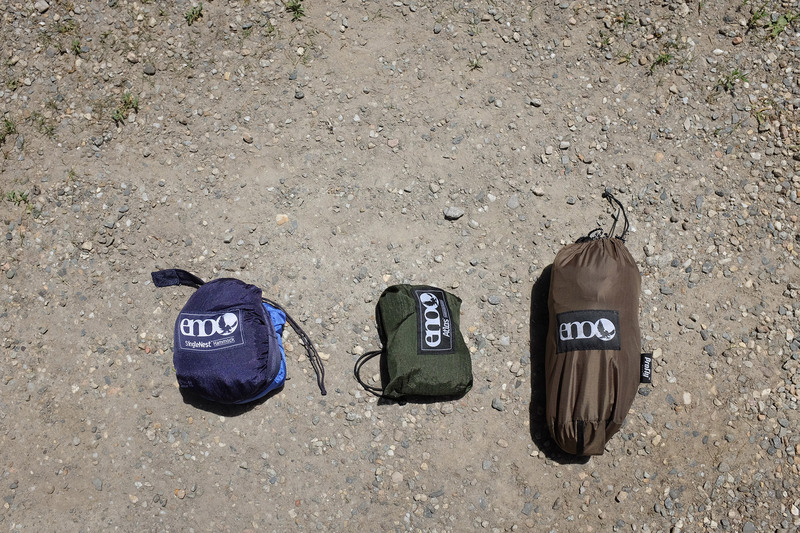 Check out the ENO Guardian Bug Net. It’s another piece of gear, but it’s worth the weight in your pack if you’re in particularly buggy terrain. Among the unique considerations hammock camping presents, keeping warm is likely the first you’ll hear about. On the ground, it’s easy: just a sleeping bag and pad. In a hammock, however, it’s not so simple. 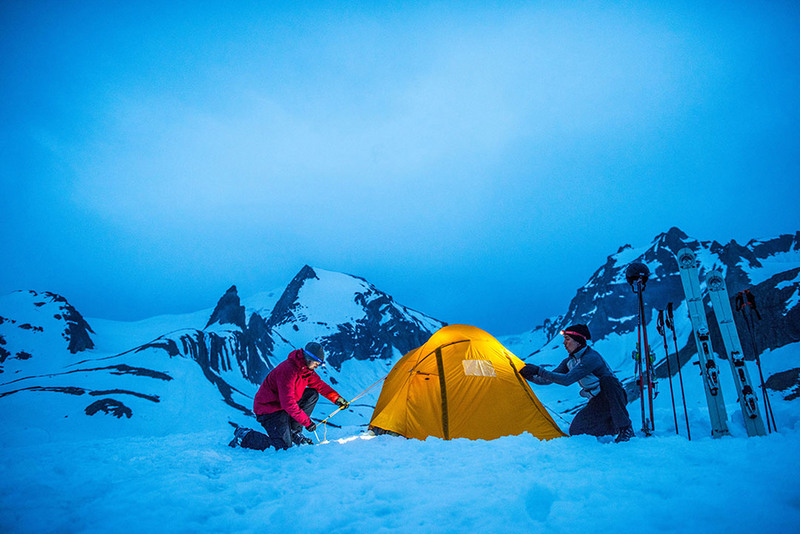 Most sleeping bags have down or synthetic insulation on the bottom layer. But, when compressed, as it is under a person’s body weight, it’s significantly less efficient than its temperature rating would indicate. On the ground or a tent platform, the surface itself and a sleeping pad, which provides insulation of its own, correct this flaw. With a hammock, you can get around this in one of two ways. Insulate the bottom with an under-quilt, which hangs under the hammock itself. Or, place a sleeping pad inside the hammock. 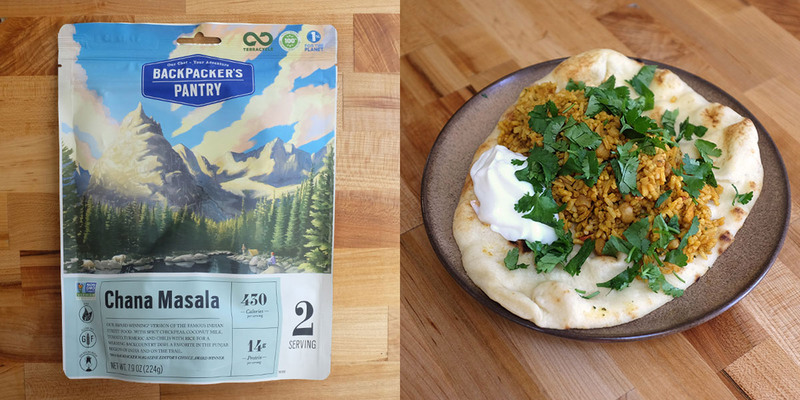 Personally, I prefer the latter, and run with a Big Agnes Deer Park 30 Sleeping Bag, a Big Agnes Gunn Creek 30º Sleeping Bag, and a Big Agnes Air Core Ultra Sleeping Pad. 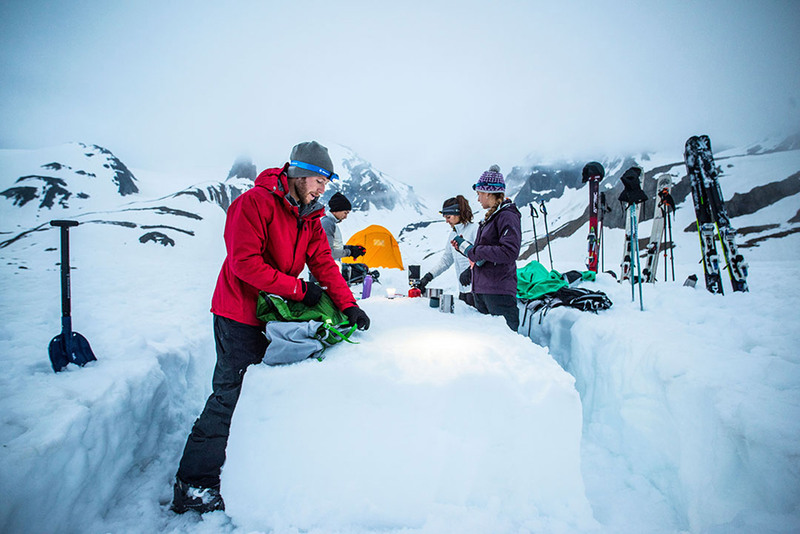 Big Agnes ditched their bags’ bottom layer of insulation for a built-in pocket to fit an air pad. But, really, you can use any bag-pad combo. Once you’re in the hammock, your weight will pin the pad down, and the sides help keep it in place overnight. I dig this setup primarily because, unlike with an under-quilt, I can use it in a tent or for cowboy camping just as easily. At the end of the day, it’s a matter of personal preference and takes some trial and error to get it right. It seems obvious enough, but a tarp or rainfly is critical if you’re out in weather or in a place where weather can move in quickly. For this, I use the ENO DryFly Rain Tarp. It’s light, it’s quick to set up, and it has kept me dry. The trick is, rig the tarp just above the hammock, so when the hammock sags under your body weight, you’re not exposed to the rain and wind blowing in from under the sides. If you’re the type that gets motion sickness, this may not be for you. You’re going to move around, be it from wind or your own tossing and turning. Over the period of a night’s sleep, this may lead to some problems. 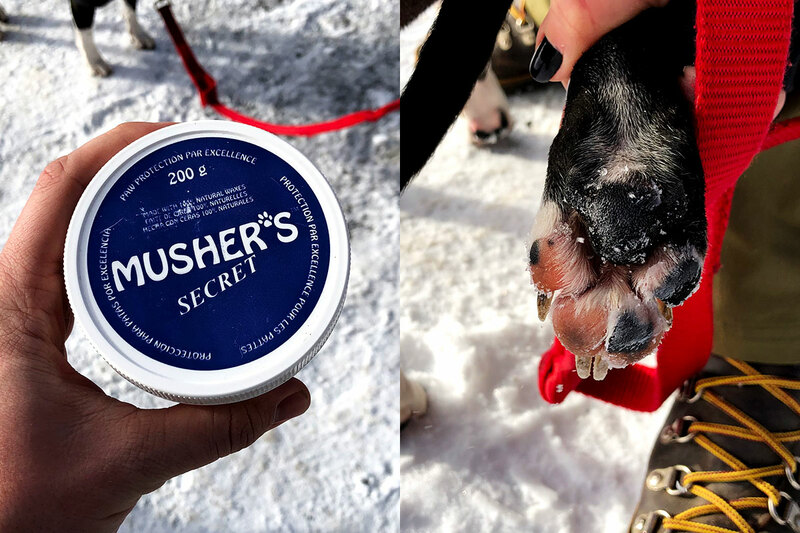 If you’re unsure, give it a go for an hour or two out in the yard on some sunny afternoon to see how it makes you feel. Laborious, I know, but sometimes, that’s just the way it goes. In the mountains, two trees are often easier to find than a patch of earth flat enough to pitch a tent. This factor alone is enough reason to give hammock camping a try. It’ll take some time to feel out your preference—the perfect hang is subjective—but you’re good to go with two trees and enough line or a pair of straps (more on that below). Keep it off the trail (human or game), and give yourself about two feet of ground clearance. That’s just enough space to keep yourself from an unfortunate midnight run-in with a curious porcupine. All right. You’ve done the dishes, rigged up the bear hang, and are ready to hit the hay. Your hammock is strung up just the way you’ve found yourself liking it in the yard and now’s the time. You’ve made your bed, and now must literally lie in it. Great! Now, sleeping in a hammock is completely different from sleeping on a surface and takes some getting used to. There’s no one way to get comfy, and just like in the yard, it’s going to take some time to find the best fit. So, try out a few different ways to see what feels comfortable. Shift your bag up or down, and change the tension on the straps—do what feels good, and don’t be afraid to adjust! Hopefully, by the time you’ve tucked yourself in, you’ve also gotten your miles in and crushed a couple of mountains. If you’ve done it well, they’ve crushed you back, and you’re just about ready to sleep the sleep of the dead, anyway.